I wished pomegranate's were less expensive and my family would eat them because Martha Stewart's latest e-mail of ideas has this great pomegranate turkey that would be easy for your grade school one's to create and use at the Thanksgiving dinner table. 1. Download and print turkey template. 2. Fold a piece of autumnal-colored cardstock in half. Staple the template to the folded cardstock, and cut on the solid black line, through all the layers, with a craft knife. 3. With one set of cutouts, tape toothpicks in place, as marked on the template. 4. With the opposing set of cutouts, apply a layer of glue and attach to the first set, sandwiching the toothpicks in between the layers of paper. 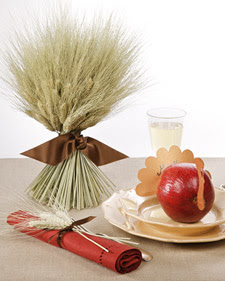 If you want to make these cute decorations into place cards, write the names of your guests across the fan of feathers. 5. Make pilot holes in the pomegranate with an extra toothpick: two holes in the stem end (for the turkey head) and two on each side of the stamen, about two inches apart (for the tail). Insert turkey head and tail cutouts into pomegranate. Get more one-of-a-kind ideas with our holiday table decorations photo gallery. For more seasonally inspired crafts, check out television's fall favorites. Go HERE for the full article.